Yosemite National Park, watching stars, with time-lapse photography. The only way life gets better than this is to go there and film it yourself. Yosemite Nature Notes 19. Yosemite’s vast acreage and remote location protect some of the darkest night skies in the country. Astronomers, photographers and city dwellers flock to the park to take advantage of this unique opportunity to view planets, stars, and galaxies. Producer is Steven M. Bumgardner, and it features, inter alia, an interview with Shawn Reeder, whose time-lapse work I’ve highlighted before. For geography, where is Yosemite N.P.? Flying commercially, which airport is the best to get to the park? Map reading and orientation: In the time-lapse sequences, you can frequently see lights streaking across the sky. Those are commercial airliners — can you tell what airport they are headed to, or from? Can you tell which ones are coming, which going? Science: What star formations do you see in these photographs that you can see from your house? What star formations are not visible from your house? Government: Who signs the checks that pay the rangers pictured in the film? For which agency do the work, in which branch of which government? People in the film discuss light pollution from nearby cities. Is there an agency in the federal government who has jurisdiction over light pollution? How about an agency in the state government? What are the rules on light pollution for cities around Yosemite? Can you identify the landmarks, the cliffs, rocks, mountains and rivers, portrayed in the film? (Students might use a USGS topographical map, California state tourist promotion maps and websites, National Park Service databases, Google Earth, Google, and a wide variety of other sources. Who was president of the U.S. when Yosemite was set aside as a National Park, and what were the controversies surrounding it? Who was John Muir? Who was Frederick Law Olmsted? 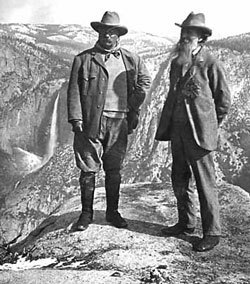 What were their roles in the history of Yosemite? Who lived in Yosemite, if anyone, before the Spanish missions were established in California? When were the missions established? How did the U.S. gain possession of the Yosemite Valley? You are currently browsing the Millard Fillmore's Bathtub blog archives for the day Thursday, September 6th, 2012.